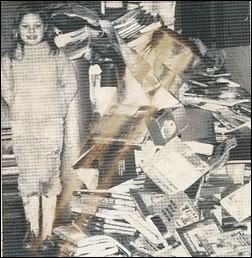 This girl looks all to happy to be standing next to a gigantic pile of destroyed, water-logged textbooks!All we know is that this photo was taken at Monte Rio School by Carl Van Dyke. The girl? No clue. Where she is now? Haven't the foggiest.If you recognize her, or know where she is now, let us know in the comments below.The Guerneville Flood Project is a week-long dive into the photo archives of the North Bay Bohemian. Read about the project here, and view more 1986 Guerneville Flood photos by clicking here.